Get ready folks, I'm about to give you a recipe for ice. Seriously, ice. When I began this blog, I never thought I'd include an ice recipe, but this, my friends, is special. You see, I've told you in the past about my year-long challenge of meat called Charcutepalooza. Nearly 400 bloggers at this point have taken on the pledge of learning to salt, smoke, brine and tackle meat like they've never tackled it before. So how does ice fit in to this whole equation. Through Charcutepalooza, I've been lucky enough to meet a community of bloggers that are simply amazing. The information that we share is amazing, but the laughs and nutty ideas we share between us all, well, that's just priceless. Not to mention, this month's Charcutepalooza Challenge is all about smoking meat. Ice was just the logical next step, or not. The smoked ice idea came from a Twitter conversation between myself, Brook from Learn to Preserve, Charcutepalooza Goddess Cathy Barrows from Mrs. Wheelbarrow's Kitchen, and Janis from Bite Me New England. Brook found the link to the Smoke Signals Cocktail in April's edition of Bon Appetit. It was created by Evan Zimmerman of Laurelhurst Market in Portland, Oregon. After a few giggles, and a bit of taunting between all these lovely ladies, we elected to take on the challenge. We were going to smoke ice, and darn it, we were going to make this cocktail. We elected Sunday at 7 p.m. was going to be cocktail hour for this smoky treat. We'd make it, drink it, and share our thoughts in the Twitterverse. Yes, we food bloggers, we do odd things like this and frankly, it's awesome. However, the treat turned out more "trick". 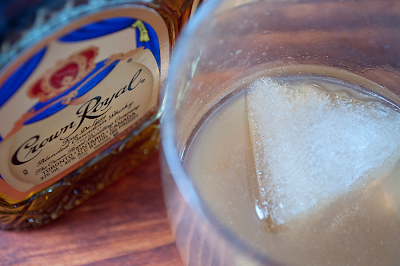 The smoky ice, it's interesting, but this cocktail too sweet for any of our tastes. Janis pronounced it a waste of booze. Cathy says she and her dinner guests sipped and discarded it. Brook didn't make it and we applauded her for that and not wasting precious whiskey. So the Smoke Signal Cocktail, the recipe is below, and you might like it if you like really sweet. The drink wasn't much, but the experience and the funny conversation was fun as hell. This blogger (with agreement from Janis) found the smokey ice to be pretty fabulous in just a couple of fingers of good bourbon. Want to smoke ice, and I mean ice cubes, read on. 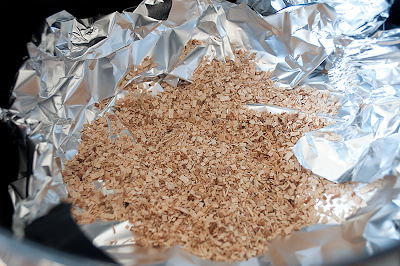 First, get out a large pot and line the bottom with heavy-duty foil, sprinkle wood chips over the bottom of pot. Turn your exhaust fan on high. Heat the pot over high heat until smoke starts to form in the pot. Now, take a loaf pan that will fit inside your pot (test this beforehand! 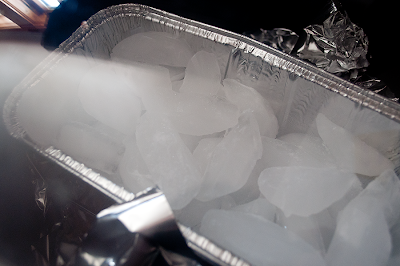 ), and fill it with ice. Next, place the loaf pan in the pot and cover tightly as you see above. Smoke the ice until just melted, about 5-7 minutes. Take off the heat, bring that pot outside, and open the lid so the smoke escapes. 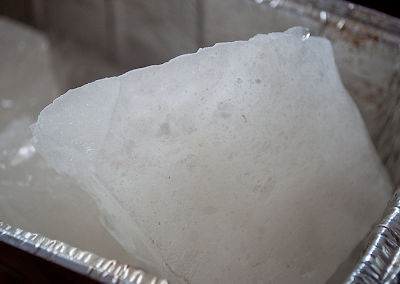 Remove the loaf pan and cover tightly with plastic wrap and place in your freezer. Allow to freeze for at least 6 hours. When it's frozen completely, take out of the freezer and crack into four pieces using an ice pick, or as I did, dropping it out on the concrete outside. I'm not fancy. Now, that is an ice chunk. Wrap your pieces up seperately if you'd like, then start on the pecan syrup. In a small saucepan, heat 1 cup water and your sugar until the sugar dissolves. Next, add the pecans and reduce heat to minimum and simmer until the syrup tastes like pecans. Pour mixture through a strainer into a cup and chill until cold, about 2 hours. Finally, after all of this. Pour 5 tablespoons whiskey, 3 tablespoons Sherry, 1 tablespoon lemon juice, and 3 tablespoons pecan syrup into a cocktail shaker. Fill with plain ice cubes, cover and shake until cold. Divide the concoction between two old-fashioned glasses. Repeat with remaining ingredients and drop a block of your smoked ice into it. This looks really interesting! I can't handle whiskey....I'm wicked lame! This looks really cool! I bet it'd be really great to just keep it simple and make a smoky Old Fashioned or Manhattan...thanks for the ice instructions! I think smoky ice would work great in something classic. I did like it in the bourbon, the cocktail itself was just too sweet. Now that's one way to WOW your guests!! This is awesome! I will say this. Put that sucker in bourbon and you've got one *happy* Kimmy. Laurelhurst Market is one of my favorite restaurants! Love it. Saw the recipe in BA and was wondering if anybody was going to do it. Heard about it on Twitter. Nice work! 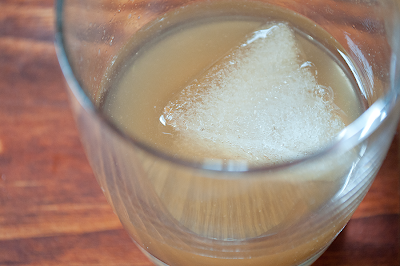 I had this cocktail at Laurelhurst Market and wanted to try it at home, so I was glad I found your recipe. First of all, I used my electric smoker, and my smoked water came out slightly murky, yellow and even an touch of sourness. (it was in the smoker for about an hour). So I diluted it by the same amount of water and then froze it. Then for the cocktail, since you said it was too sweet, I only used 2 parts of the syrup and this came out great! I used Jack Daniels (I think this makes a big difference compared to Crown Royal that is a Canadian Rye and much sweeter with less bitterness and no smokiness). Perhaps a mist of Isly whisky (Laphroaig or Lagavullin) would make it even better.